This opportunity to own the full tip of Frond I. 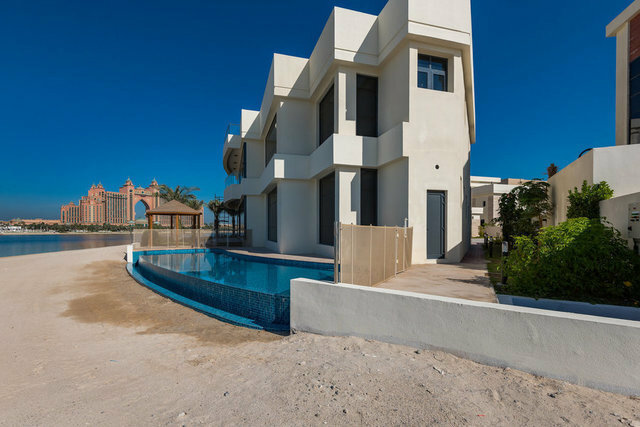 This includes five brand new custom gated villas located on the tip, set on a 60,000 sq ft. plot that is sea facing on 3 sides with sea, marina and Atlantis views. Each one of the four villas offer approximately 9,500 sq ft. of built up areas, with five large bedroom suites. The fifth and largest villa boasts a built up area of 13,754 sq ft. inclusive of six bedrooms. All with Bango design en-suites, modern gyms, all Italian marble floors serviced top to bottom by the private elevator. Each Contemporary villa offers an individual and unique view of the Palm and Dubai’s iconic landmarks. Homes are fully automated for lighting, air conditioning (Carrier) and curtains inclusive of audio and video intercoms with CCTV. All the villas are brand new and inclusive of private swimming pools, jacuzzis and wrapped entirely around by your own private beach. The size and location of the plot offer residents maximum security and privacy.